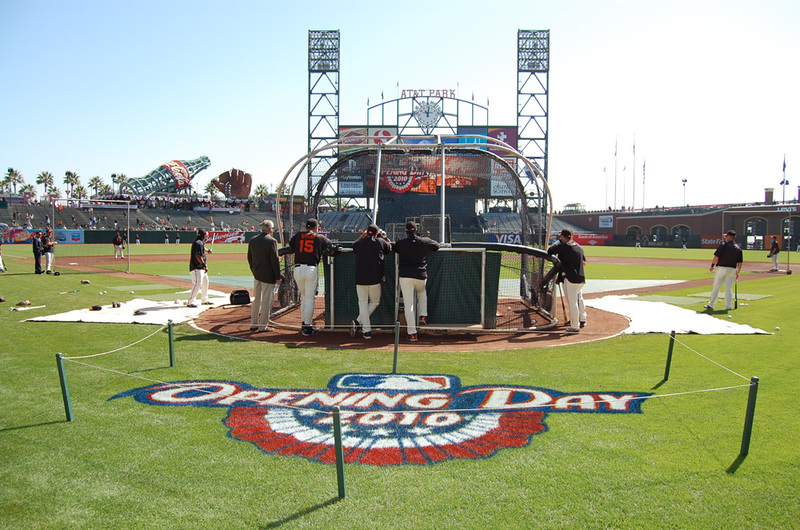 It’s a spectacular day here at AT&T Park, where the Giants are taking batting practice before Opening Day vs. the Braves. If you’re coming to the game, why aren’t you here already?? Seriously, make sure you get here early for the pregame festivities. They will include a special video tribute to someone special in the Giants family, the national anthem performed by Matt Nathanson (and he sounded GOOD in the pregame sound check) and the first pitch thrown by 49ers legend Jerry Rice (he let the cat out of the bag himself this morning on Twitter, of all things). There will also be the traditional Opening Day flyover, from the VX-9 Vampires out of China Lake-Point Magu, and the first 40,000 fans get Opening Day calendars.